“When you can sell a 9 or 10 thousand dollar machine for $5399 it get’s people excited.” Robert Foster. By Paul Sikkema. Join the conversation on Facebook! I purchased a 6 acre property after mowing season was already over last year. This is my first large property and I am in the market for a ZTR. 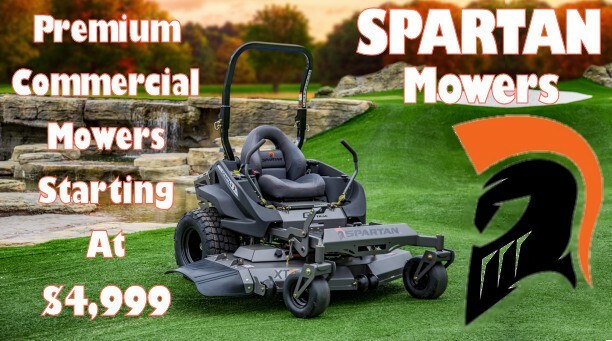 There is a dealer within three miles of me that offers some great at home maintenance services that sells both Spartan and Hustler mowers. The dealer is really pushing the Spartan brand for my application. They seem to have a lot of heavy-duty features found in much more expensive setups. I saw in one of your past responses that you cannot recommend a mower from an “unknown” manufacturer but I was curious if you had any further thoughts on this brand of mowers. I really like the reasonably priced plug and play accessories and the idea of getting a lot mower at their price point. I understand there is a lawsuit on them already from Bad Boy due to an alleged patent infringement as the designer/owner of the Spartan brand supposedly came up with part of the design while he was an owner of Bad Boy. Apparently Spartan and Bad Boy are literally right next door to each other and had an ugly split. The model I was looking at the RT Pro 61″ with either the Kohler or the Briggs motors. Have you tested any of the Spartans yourself? Hi Ben, This is the second season for Spartan mowers. It’s made by a company that has disrupted the ATV industry and yes there is some interesting history with Bad Boy. Spartan is an interesting marketing application. Let’s take a conventional zero-turn and make it look beefy, manly and Transformer looking – let’s add features that no one else has like triple jointed arm rests. The owner, Robert Foster, built twelve prototypes in his garage over the summer of 2015 and then kept them secret until the big L&G dealer show (GIE-EXPO) that October. He then sprung them on the world at one-third the price of the current market. Will his equipment be worth the cheap cost? It’s still too early to tell. We’ve already proven that the Chinese zero-turns are not worth the hassle no matter how cheap the cost but this company and it’s owner is different. This a U.S.A. built machine with the best possible engines, transmissions and parts. Mr Foster is building a solid dealer base with the parts and service to keep your machine running. He has the vision, the resources and the business experience to make this work. This guy has the money to make this company last 5 years or more which should get it through the “new” phase of bringing a product to market. In my experience buying a machine like the Spartan that has not had at least 2 full years of on-the-ground prove-design is not always the best choice for you. One of the most controversial innovators in the industry, Dane Scag, was that way. Mr. Scag would design a machine on paper, build it, and then sell it at a lower price than anyone else. As problems arose with the design he would then fix it with recalls and updates. Starting out in the mowing business I owned a few of them because of the price. But, they were down for repairs about 20% of the time. I liked the mowers a lot , but was very frustrated about the down time. My dealer finally convinced me to buy an ExMark and guess what? My on-lawn mowing time increased, my labor costs dropped dramatically because my crews weren’t waiting for repairs and my repair costs dropped 50%. Companies like Toro, ExMark and Ariens are very conservative in introducing new “radical” machines and improvements. They spend 2-3 years designing, testing and making sure the design works. They are confident that the machine will last a long time before they even offer the first machine for sale. As a Homeowner should you buy one? Understand that I was using the mowers in the above example commercially 30-50 hours a week and with your 6 acres you will only use your’s an hour and half a week. Also understand, with the recent Raven MPV-7100 hybrid mower debacle I am probably overly-cautious of recommending a new product from a new manufacture. I spent some time with the 61 inch last October at the GIE-EXPO. I looked at all the features, build quality and test drove it for few minutes. The mower is designed well and should last years. 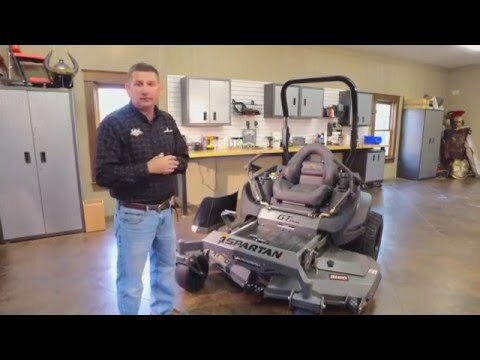 I don’t expect any issues with the Spartan mower but if you do buy one I suggest that you stay in close contact with the dealer so that you get any updates before your warranty expires. I repeat, the mower is designed well and should last a homeowner years. Ben, I’ve been around this business for over 30 years and I’ve seen at least 50 companies like this one try to break into the zero-turn market. Anyone remember the “Hill Billy” “Bunton” or “DewEze?” There are only 3 or 4 that gained enough market share to stay in business. I hope Mr. Foster can break through the “new product launch” and deliver the quality mower at the price he has envisioned. Did you buy a Spartan last year? Please tell us how you like it! Hi Paul I am considering the Country Clipper with the joystick vs. two stick control what can you advise me re. reliability of the joystick. Also is the Parks driving system really much better than Hydrogear? Bought my 61inch Spartan RT Pro last July. As of today…. There’s not one thing I can dis / gripe about. Great price, great quality, Wait 1 thing, the stickers on the sides that say “SPARTAN” look like they won’t make it long. I’m serious, so far “great” mower. Hi Paul, I looked at the Spartan last week, and I also am going to look at the Toro HD 54″ with MyRide and the Ferris IS 700N all three rave about their suspensions and smooth rides, which of the three do you think offers the most smooth ride? I live on 4 acres and the terrain is a little rough, I currently use my JD 2010 sub compact tractor to with a mid mower to cut my yard, but that tractor beats me to death and I am looking for a smother ride. Your opinion is greatly appreciated. I thought the idea of styling a mower with a sports car theme seemed silly, but after watching the video it appears that Foster has done a good job of incorporating function into his form. The funny thing is, after watching his videos, I looked at the Swisher article. My first thought was, “Wow, I wouldn’t want to be seen on that thing!” Then the whole muscle car motif made a lot more sense.